Dolphin Wild Island Cruises is an Australian owned small local family business. We have been operating our marine eco cruises for over 30 years in the Newport (Redcliffe), Brisbane, Moreton Island (Tangalooma) and Moreton Bay areas and have a 100% safety record. Our Dolphin Wild Eco Tours operate all year and are not a short term seasonal operation. This gives our staff the best knowledge of our animals and location and gives our customers the best possible experience! As we are at sea quite often, we apologize if we miss your phone call. Please book online or email us. Spacious, air-conditioned and the quickest cruise (45 minutes) to Moreton Island with a Newport (Redcliffe City) departure. 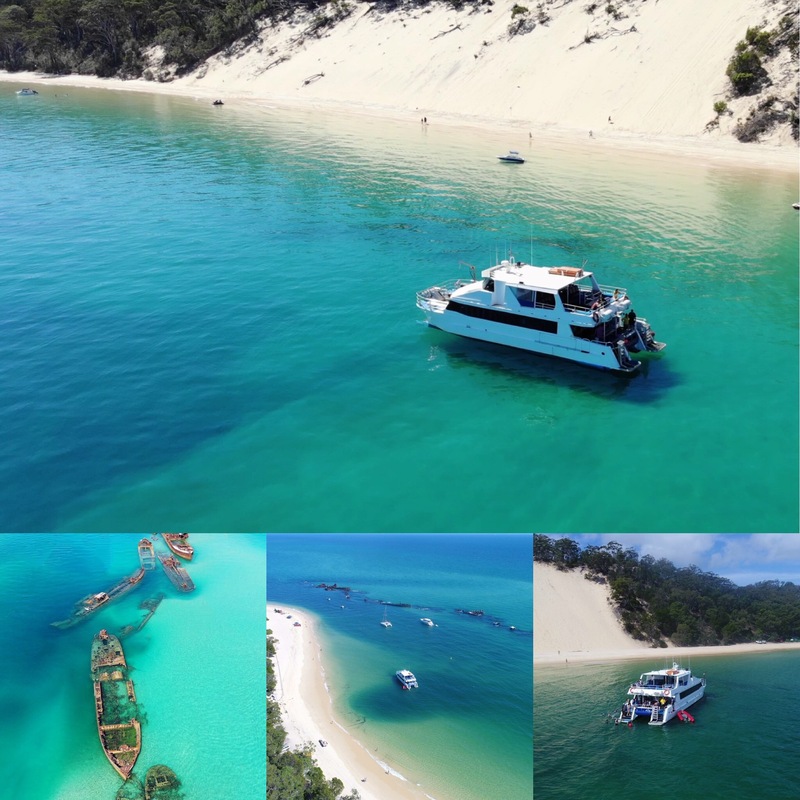 Our vessel, SUPERCAT, is Brisbane's most comfortable Moreton Island Eco Cruise vessel with four customer areas – front deck, back deck, saloon (dry lounge area) and top deck. These areas are spacious and enable customers to get the best viewing of our dolphins, dugongs, turtles (and whales in the winter season). While spending the day at sea with us, you will be able to relax on our vessel SUPERCAT while enjoying the air-conditioning to keep you cool in the summer heat, a large dry saloon area with comfortable lounges and tables, 2 toilets/change areas, licensed fully stocked bar with commercial refrigeration for an ice cold beer, all day free tea and coffee, showers, large TV screens with movies and our large safety vessel for both beach ferry services and accompanying the snorkelers on the guided snorkel & fish feeding tour. Our departure point is at Newport Marina, Newport (Redcliffe Peninsula) and is the shortest distance to Moreton Island from Brisbane. You will enjoy a quick 45 minute cruise across the bay on SUPERCAT's stable platform. Our friendly and experienced Captains have nearly 30 years' experience operating in the Moreton Bay Marine Park and know all the best areas for animal encounters. Our Eco Guides and Hostesses will ensure your comfort and enjoyment. Our cruise suits all ages and is roomy and safe for prams. For your comfort we have a rubber duck (safety vessel) to transfer children, elderly or non swimmers to the beach. As we slowly cruise along the shallows off Moreton Island, sit back and hear our informative commentary by our experienced marine staff. Hear the unique history of Moreton Island including WW2 gun emplacements and sight its marine life such as Bottlenose dolphins, dugongs, green sea turtles and the humpback whales. Our families of dolphins love to come and play beside our boat and usually jump into our bow wave and say "hello". Dugongs and turtles also live in these "go slow zones" and the humpback whales will bring their calves into the bay to rest during their migratory season (July to October). SUPERCAT'S three large animal viewing decks make it possible to get up close & personal to our iconic local marine life. 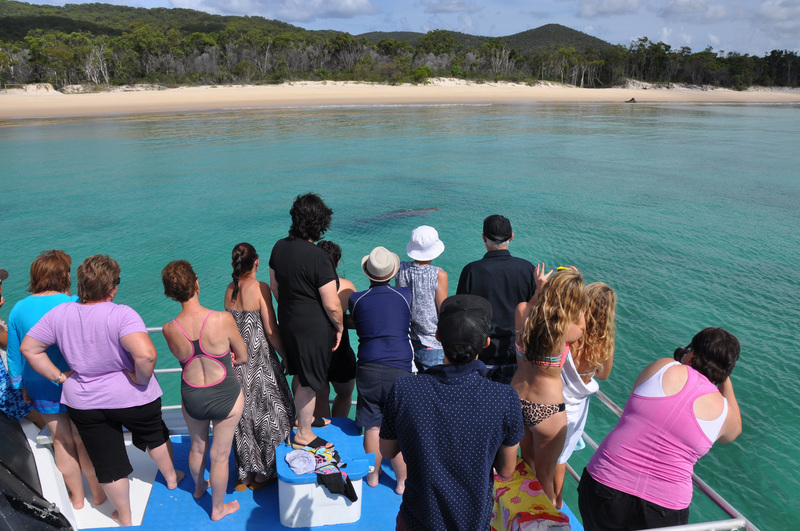 This picture shows our customers on the front deck of SUPERCAT viewing "Fatty Boombah" – our favourite dugong! An optional extra on the day is this world renowned group of wrecks that were originally sunk to provide protected waters for the boaties at Tangalooma. It is known for its richly diverse environment, including thousands of fish - tame enough to eat from your hands, invertebrates, hard corals, Wobbegongs and sometimes even a visiting turtle around the 15 scuttled wrecks. The wrecks are also home to magnificent marine birds nesting and feeding from the superstructures of the wrecks. These include Sea Eagles, Whistling Kites and Cormorants. Don't be surprised if a marine bird swims beside us during the snorkel; they try to catch the fish that follow us. Our snorkel procedure is one of the industries safest and includes a safety vessel following the snorkelers for any early pickups, wetsuits, mask/fins, glove for protection and a noodle if you require it. We traverse the length of the wrecks, with our mother ship SUPERCAT moving to the opposite end to pick us up – no swimming back against the current! During the snorkel we feed the thousands of fish we encounter. Our Guided Snorkelling & Fishfeeding Tour of the Tangalooma wrecks is an optional extra on the day. Our cost of $20 per adult and $10 per child (up to 14 yrs) includes Eco Guides, safety vessel, wetsuits, mask/fins & noodle if required. Please note, for your safety, participants must be able to swim. You are welcome to bring your own mask/snorkel/wetsuit, but the snorkelling fee will still apply. If you don't wish to snorkel, no problems, SUPERCAT anchors right beside the wrecks, so non snorkelers can still experience & photograph these magnificent wrecks and Moreton Island. If you are lucky, the Captain may take you on a tour through the wrecks on our safety vessel for your enjoyment. Imagine sitting on a large net and being towed behind SUPERCAT. Some of the most fun you will ever do, it's like being in a spa at speed. Sometimes our dolphin friends come past to see what all the fun is about. SUPERCAT is the only Moreton Island Eco Cruise with boom netting included in our price! The wildlife in our Moreton Island Marine Park is spectacular! We have even had a seal play around SUPERCAT and jump on our rear duckboard. The dolphins, dugongs are turtles are sighted all year and the dolphin pods know the sound of SUPERCAT and will cheekily swim towards and around her. The area is also fortunate enough to witness the migration of the Humpback Whales from June to October each year. These magnificent animals often come into our Moreton Bay and surrounding areas during their season and are very playful and inquisitive. Boom-netting - experience the rush of being towed through the ocean behind the vessel on our Boom-Net! Licensed full size commercial refrigerated bar with a variety of ice cold alcohol, soft drinks, chocolates & chips for purchase. Please note that SUPERCAT's bar is licensed so NO BYO! Join us on SUPERCAT for Brisbane's night of fireworks and entertainment cruising the Brisbane River. SUPERCAT is positioned every year in one of the best central places to view the fireworks. You can load at Newport Marina, Newport to cruise across the bay and up the Brisbane River (at no extra charge) or Mowbray Park, East Brisbane. Book early for this great evening. Riverfire is a massive fireworks display that lights and explodes over the city and signals the end of the Brisbane River Festival. Don't delay, book now and cruise with Dolphin Wild up the Brisbane River to find the perfect position for the fantastic display and amazing sights that light up the sky. SUPERCAT's bar is Licenced, so No BYO. Call 07 3880 4444 now to make a booking. SUPERCAT vessel loads 8:00am and departs from Newport Marina, 158 Griffith Road, Newport 4020. Vessel returns to Newport Marina at approximately 4:00pm and return transfers to Brisbane will arrive back in the city around 5:00pm. Please note that there are NO Eftpos or Credit Card facilities on board for payment of snorkelling or bar purchases. SUPERCAT's bar is licensed, so NO BYO. Dolphin Wild operates all year depending on passenger numbers and weather conditions. Our office is open 7 days a week between the hours of 9:00am and 5:00pm. Please book online using the Bookings & Trip Schedule button above or by email as we are often at sea and unable to take your phone booking.